In yet another revelation, the New York Times reports that Virginia Fields' campaign has violated city rules with a photo of herself speaking to NYC uniformed fire fighters used in her campaign literature. Even though -- as the Fields campaign stated -- the photo was taken in her capacity as borough president, it is being used for political purposes and could give the impression that fire fighters are supporting her candidacy. For the New York Times article, click below. Update: as of July 10, the photo is still on the Fields campaign's web site. The mayoral candidate C. Virginia Fields has been using a photograph of herself with New York City firefighters in campaign materials, in an apparent violation of city rules against using unauthorized photos of firefighters for political purposes. The revelation of the firefighters photo comes as Ms. Fields's campaign is still dealing with fallout from a separate campaign flier that included a photograph doctored to make it appear as if the candidate were surrounded by an ethnically diverse group of people. Ms. Fields, a leading Democratic candidate and the Manhattan borough president, is considering a campaign shake-up as a result, aides said yesterday. The photo of firefighters with Ms. Fields appeared in her first major political mailing to voters last month and was also still among the photos on her campaign Web site last night. 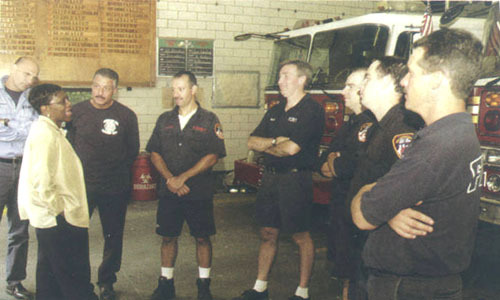 The image shows a casual Ms. Fields speaking to a group of firefighters in a city firehouse. The New York Fire Department does not permit the use of photos of firefighters in political campaigns, fire officials said yesterday, and also bars their use in advertisements unless explicit permission is granted by the deputy commissioner for public information. It rarely is, said the deputy commissioner, Francis X. Gribbon. Asked to assess the campaign's use of the photo, Mr. Gribbon said he thought it was inappropriate. "For the purposes of a political campaign, I would not approve of that photograph," he said. "We don't endorse political candidates or become involved in campaigns in any way. So we would not allow it." That said, he noted that political figures like Mayor Michael R. Bloomberg and candidates for office sometimes appear in news photographs and on television with uniformed officers including those from the Fire Department. But the department generally frowns on candidates using informal pictures in a political context, Mr. Gribbon said. Ms. Fields's campaign manager, Chung C. Seto, said the photo with firefighters had been taken of Ms. Fields in her capacity as borough president and that she did not find it inappropriate to include it in campaign material. Earlier yesterday, Ms. Fields held a news conference to acknowledge the doctored photograph of her with supporters, which was in fact a composite of four separate photographs. The images were manipulated to show Ms. Fields surrounded by Asian-Americans, whites, Hispanics and blacks at what appears to be a single event. Advisers to Ms. Fields described her as annoyed by the misstep, and said she viewed the cause as miscommunication within the campaign. As a result, they said, Ms. Fields plans to reassess the responsibilities of her staff, including those of Joseph C. Mercurio, her chief political consultant. One adviser who spoke on the condition of anonymity because of the sensitive nature of the photo said that Mr. Mercurio would eventually share more of his authority over political strategy, paid media and direct mail with others on the campaign staff, in particular Ms. Seto. Mr. Mercurio said in The Daily News yesterday that the photograph was a "collage," and defended the use of such composites as not unusual in campaigns. He said yesterday that he did not believe his role in the campaign would change. At her news conference, Ms. Fields blamed the company that produced her campaign literature, Winning Directions, a national firm. Ms. Fields read aloud from a letter from Winning Directions expressing regret at the mistake, but suggesting that creating a composite image is "in keeping with standard practices of the graphics industry." "I accept Winning Directions' acknowledgement addressing their grave mistake and taking responsibility for this blunder," Ms. Fields said on the steps of City Hall flanked by several dozen Asian-American, Latino, African-American and white supporters. She suggested that the spirit of the image was in keeping with her record on diversity and the thrust of her campaign, whose slogan is "A Mayor for All New Yorkers." Yet she admitted that she could not identify two faces in the composite photograph. Reporters asked Ms. Fields whether the gaffe indicated her ability to manage a campaign and, if she were to win in November, New York City. Ms. Fields said the press conference showed that she was handling the issue and was a capable leader. Wouldn't you rather have simply taken a single photograph of the kind of ethnically diverse New Yorkers you see all around you, a reporter asked. "In hindsight, absolutely," Ms. Fields replied.